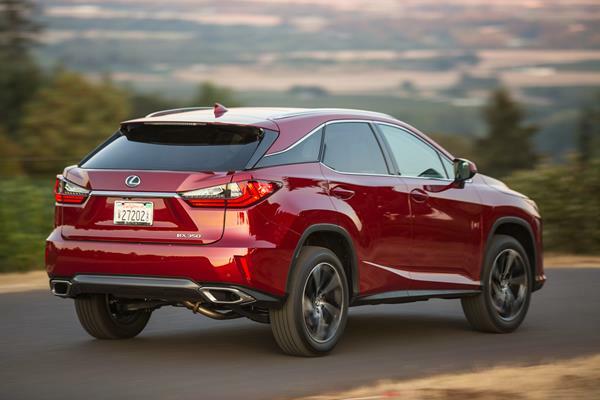 The 2016 Lexus RX 350 has been completely redesigned from its previous renditions. The new design is polarizing, to say the least, but takes a bold step into the radical that marks the Lexus brand apart from its parent, Toyota. The new RX also gains some girth and length, which translates to more interior space for passengers. The interior design for the new RX 350 is well done and very upscale - even more so than many other luxury crossovers. The two-tone look and lifted dashboard are solid complements to the excellent materials and workmanship that Lexus is already known for. The back seats are adult-friendly and comfortable and the controls layout is more canted towards the driver for better ergonomics. That's not to say that the new RX 350 is perfect for everyone. There are some versatility and technology concerns to go with its new look and interior. So shoppers may want to look around dealership row a bit. Unusually bold design, even for Lexus. Strong passenger ergonomics to the interior. Good fuel economy and excellent safety. Exterior look is very polarizing. Cargo space and versatility are not that good. Infotainment is clunky and distracting. To call the new look of the Lexus RX 350 "polarizing" would only be hinting at the emotional drama it can create in the onlooker. The huge black grille is both menacing and eye-grabbing, the body lines are strongly cut, and the floating rear roof design is elegant, but perhaps out of place. Then come the trapezoidal wheel wells and extremely cutting-edge wheel designs to go with the chrome edging and the small, limousine windows of the greenhouse. This overall look sounds hodge-podge, but Lexus' designers seem to have had a good bead on what they wanted to accomplish with the 2016 RX 350's new look. It all blends well, but won't be what every luxury crossover buyer wants. The front grille has the new Lexus look and dominates the front fascia of the RX 350. Sliver-cut fog lamp bezels are found to either side and above, beginning at the deepest inset of the hourglass grille, are headlamps that stretch back into the fender over the tires in a sharp-edged design. Above, the edges of the Lexus hourglass from the grille continue along the hoodline as tall ridges that flow up into the front pillars to frame the windscreen. Simple near-bone lines in the hood help give it shape in the middle. Bodywork is busy, riding the edge of being over-done. Rounded well edges are countered by straight lines from underneath the headlamps that pick up behind the well to continue along the sides, becoming more accentuated as they flow through the front door handle and continue back, in a slightly upward stroke, to create a small shelf above the taillamps. This creates a tapered beltline that is mirrored by the slash cut of the upward-tilting running board line below. A second line flows from the top of the fender and downward, meeting the major beltline ridge at the middle of the rear door. The roof, meanwhile, is relatively flat, but appears to be tapered downward at a sporty angle thanks to the edge created at the rear for the pillar-less look where black glass replaces bodywork for the floating roof appearance. At the rear, the rounded glass and sport edge flattens at the tail lamps to go straight down in a fast cut that adds to that sporty appearance. 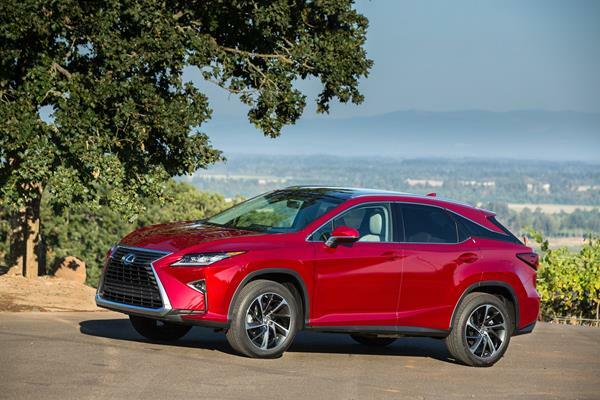 In all, the complicated lines of the 2016 Lexus RX 350 are a bold statement and make for an unusually powerful design theme from Toyota's luxury brand, setting it apart from the mother company and its traditionally low-key looks. If what you're looking for in your luxury crossover is a beautiful interior with a lot of comfort and passenger seating room, then the RX 350 is a perfect 10. If, however, you are inclined to think about overall versatility and usefulness, then the newly-redesigned Lexus crossover isn't quite as impressive. Beyond the high quality materials, excellent ergonomics in driver and front passenger design (with the exception of the infotainment controls), the 2016 RX 350 falls short. Cargo space is the first note in that regard. Lexus has re-engineered how they measure cargo space, which means their numbers don't match anyone else's for comparison. They list cargo space, with the second row up, at 18.4 cubic feet and 56.3 with those rear seats folded. What that doesn't say is that the rear seats do not fold flat and that the rear hatch is hinged at a position lower than the rest of the vehicle. This means that the full roof height is not necessarily accessible when loading bulky items. It also means that those bulky items are likely to get hung up on the not-quite-flat rear seats. Most people can probably maneuver a mountain bike or a couple of kids' bikes into the back, but don't expect the Lexus RX 350 to make trips to the hardware store easy. Where the new Lexus does shine is in passenger space. 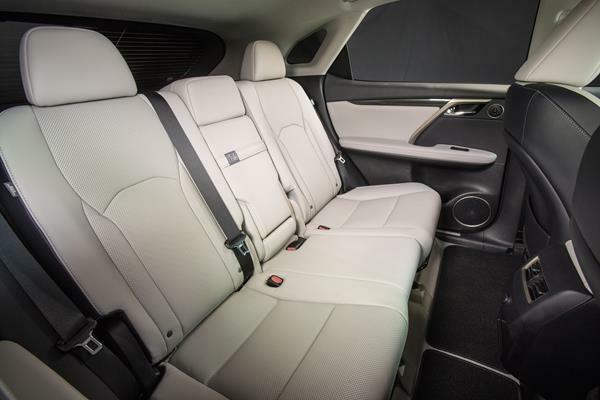 The front seats, even in the sportier F Sport, are exceptionally well done with a lot of comfort. The rear seats are adult-friendly and as adjustable as any in the segment. We also like the two-tone look and higher dashboard. The huge infotainment screen is also a bonus, being easy to read. 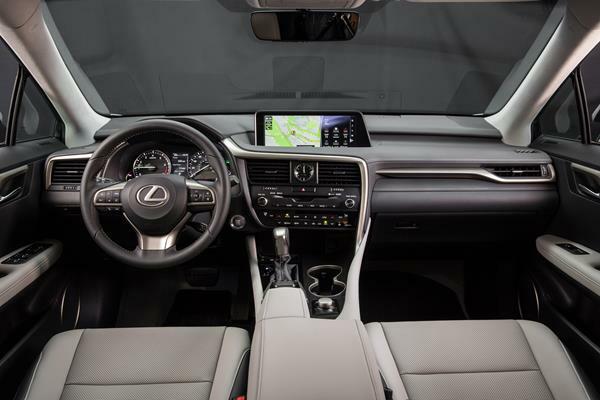 Although the 2016 RX 350 has a large, easy to read infotainment screen with the upgraded 12.3-inch display option, it's hampered by the low-tech and cumbersome Remote Touch controller with its mouse-like operation and annoying cursor jumping menu selections. You'll find yourself looking away from the road quite often when manipulating this system, even for common tasks such as channel changing. We do note that this mouse-style interface is a step backward in the eyes of Lexus, but a leap forward from the horrible touchpad that nearly replaced it last year. 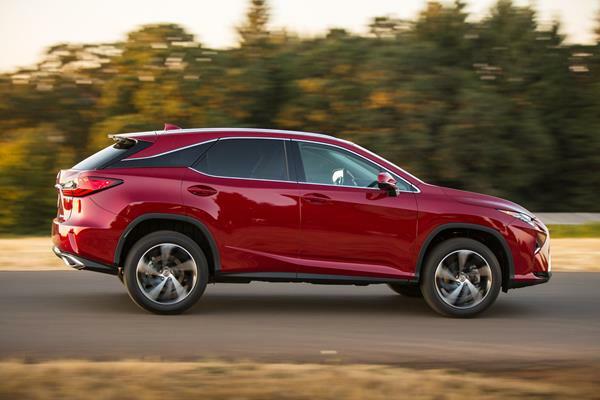 The 2016 Lexus RX 350 is EPA-rated at 23 mpg combined, with 20 mpg in the city and 28 mpg on the highway in the standard front-wheel drive models. In all-wheel drive, those numbers drop to 22 mpg combined (19 city, 26 highway). In our week with the 2016 RX 350 F-Sport model (AWD is standard), we saw an average of nearly 20 mpg overall. That was about what we expected given our altitude and short mix of light offroad driving. So far, the 2016 RX 350 has done well in expected reliability, proving out the reputation that the Lexus brand has in that regard. J.D. Power and Associates have given the 2016 Lexus RX 350 a score of "Among the Best" in its Vehicle Dependability Study results. Lexus enjoys a good reputation for safety as a brand and the 2016 RX 350 certainly seems to be living up to that. The crossover has received "Good" scores (the highest possible) in all published crash tests by the Insurance Institute for Highway Safety to date. Optional safety features with advanced options such as adaptive cruise and collision warning and mitigation are also solid additions to the safety cred of this new RX. Enough so that the IIHS has given it the top-rating of Top Safety Pick Plus. So far, the National Highway Traffic Safety Administration has not published crash test results for the 2016 RX 350. Some rivals to the RX 350 can boast better numbers on paper, but none can best this Lexus crossover in how sporty and fun it feels to drive it. Especially in the F Sport package with its slightly enhanced engine grumble and damper adjustments. 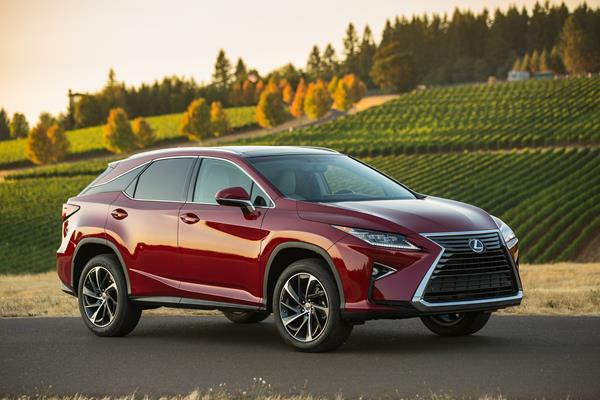 Powering the 2016 RX 350 is a 3.5-liter V6 that produces 295 horsepower and 267 pound-feet of torque. An eight-speed automatic transmission is standard, as is front-wheel drive. AWD is optional on all but the F Sport model, where it's standard. Most can expect to see 7.5-second 0-60 mph times in this crossover and towing is rated at 3,500 pounds when equipped. On the road, though, the 2016 Lexus RX 350 is sportier than it seems and a lot of fun to drive. Despite the higher seating position of a crossover, it's very car-like in its handling and appeal. The RX 350 won't hit corners like a sports car, but it certainly feels as if it might give it a good try. It's also smooth and quiet on the highway when driven normally, thanks to excellent damping and the quiet transmission it uses. In terms of driving fun, the performance of the RX 350 may be its strongest selling point. The Lexus brand has a strong value-holding history and the RX 350 will go with that trend. Unlike most luxury auto brands, Lexus vehicles tend to hold value well with a lot less depreciation than others. The starting price for the 2016 RX 350 is around $42,000 and holds average value compared to the market, but most buyers are adding package options to boost the price into the mid-40s where value is a lot stronger in terms of bang for the buck. Were we buying, we'd eschew the wallet-draining F Sport model unless having the extra performance goodies are very important. It's difficult to compare the RX 350 with other luxury crossovers given the wide variance in the field. In terms of exterior look, the RX is definitely a much bolder design than most of its competitors, on par with the Mercedes-Benz GLE. On the other hand, more contemporary and stylish competitors like the new Lincoln MKX, the BMW X5, and the Volvo XC90 have a lot of appeal. In the BMW, more performance is also had and in the Volvo a lot more versatility. Yet in the luxury crossover market, looks are as important as usability and the Lexus RX 350 definitely has its own look. In terms of value and reliability, the Lexus also definitely leads the pack. We really like the comfort level of the interior and the fun drive dynamics of the F Sport. The new, larger design also lends itself to more roominess for passengers, but not so much for cargo. 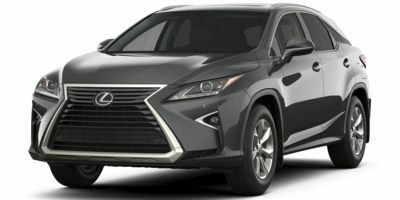 In the end, most buyers of the RX 350 will be purchasing for a combination of value, expected reliability, and the unique looks of this new crossover. We can't blame them at all. Interested to see how the 2016 Lexus RX 350 ranks against similar cars in terms of key attributes? Here are the 2016 Lexus RX 350 rankings for MPG, horsepower, torque, leg room, head room, shoulder room, hip room and so forth.